Supergirl focuses on the women as Kara and Maggie have to put their differences aside when Alex is kidnapped as leverage for a demand. This season has been inconsistent in terms of the storytelling but one thing this show gets right more than it doesn’t is the characterisation. Developing Alex from a one note tough girl into someone with depth and agency has worked brilliantly and her relationship with Maggie is one of the best written TV relationships that I’ve seen for a long time. With a meaningful relationship built up it means that there is a tangible emotional connection when there’s a threat. In this case Alex is kidnapped and Maggie has to deal with doing her job while her feelings for Alex cloud her judgement. It’s powerful and really well played by Floriana Lima who does most of the heavy lifting in this episode. Her internal conflict between remaining professional and being driven to reckless behaviour because of her concern about Alex comes through clearly and adds a sense of urgency to the episode. Maggie is the main perspective of this story and it’s great to see. Another conflict she has is with Kara. They both have very different ways of viewing justice and both of them are valid to some extent. Kara’s view is that the method doesn’t really matter as long as the criminals are caught. Her invulnerability means that she often recklessly rushes into situations knowing that there is no risk to her. What she fails to account for is that this approach causes a lot of collateral damage which causes other issues. The case study in this episode is a hostage situation where Maggie is negotiating and clearly making headway before Kara takes it upon herself to interfere. Her actions resolve the situation but don’t necessarily make it any better. Maggie tells her that criminals use something called the “Supergirl defence” which often keeps them out of prison. There’s definite scope for Kara to take this on board and improve her methods as a hero. This potential is beside the point in this case as the main objective is to provide some friction between Maggie and Kara. The honeymoon period in Maggie’s relationship with Alex is over so there’s no real need to hold her tongue in order to get along with Kara. Maggie feels comfortable being honest with her and it creates the slightly adversarial situation that we see here. Interestingly Kara backs down as she knows that that Maggie has a point. It also says a lot when she can’t stay in the same room with Maggie when there is that tension between them. Kara needs to handle disagreements better so I hope this is returned to as an opportunity for personal growth. I also found it interesting that Maggie makes the distinction between Kara and Supergirl. She is fine with Kara as a person but has issues with what she does as Supergirl. It’s a shame that this conflict hasn’t been brought up before as this could have been an interesting dynamic to play with before this point. This disagreement underpins the episode and takes both characters on a journey where they end up seeing the other side. Maggie acts recklessly and outside the law to have the chance to free Alex where Kara realises that rushing into a situation without considering it isn’t always the best way to do things. Putting them on the other side of their own arguments is a natural way for this to develop and leads to a satisfying realisation for both characters. The resolution feels easy from a plot perspective as it basically amounts to Kara delivering an impassioned speech about being a better person but she had to get to a point where she was in a position to relate to what Maggie said earlier in the episode. For Kara it was about pushing aside her preconceptions as well as her misconceptions about her own heroics and realising that she can be better too. It’s a powerful realisation and it lets Maggie see the other side as well as re-learn the lesson that she tried to teach Kara earlier in the episode. The villain of the episode is a bit of a mixed bag. On one hand I really liked the idea of an innocuous figure from both Alex and Kara’s past going after Alex and using Rick Malvern who was previously seen in flashback back in the season 1 episode “Manhunter” was a nice touch. The flashbacks are repeated here to remind us of who he is but it’s a quick way to give the character some history that works reasonably well. In the present day he is played pretty well by David Hoflin but I had issues with the way he was written. He’s one of those villains who is constantly one step ahead of everyone and has considered every possible angle. Somehow he has managed to figure out a way to block J’Onn’s telepathy, knows that Kara is Supergirl and has managed to follow them both around while planning his intricate plan to the last detail without anyone picking up on this. Considering he’s an ordinary human this really strains credulity and the episode doesn’t develop him to the point that he is believably capable of this intricate plan. Not only that but he has the perfect backup plan in case Alex manages to come up with a plan to help the DEO locate her. I’d expect something like this from Lex Luthor or Maxwell Lord but Rick isn’t portrayed as being that kind of genius. He is one of the better villains the show has had though. His objective is relatively simple. He wants to free his father Peter Thompson (Gregg Henry) because they have a strong relationship. Rick talks about his abusive mother and how his father saved him from that which is as good a motivation as any to get him out of prison. 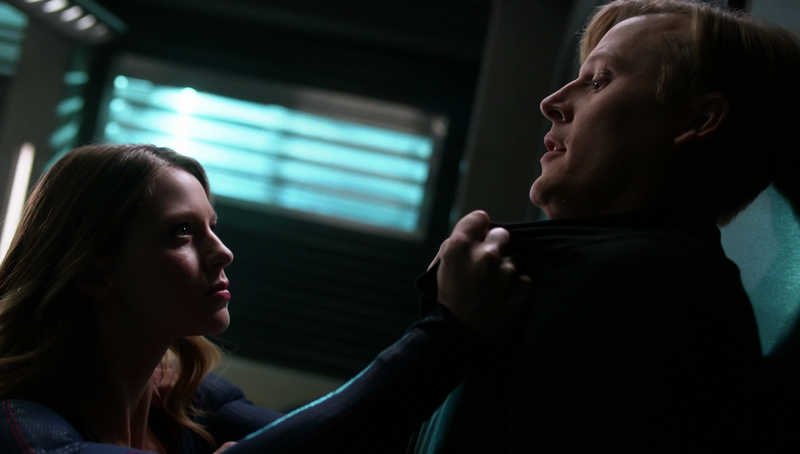 Peter has a memorable presence in the episode with his “confusing pleasure” remark when J’Onn, Maggie and Kara come to question him. His appearances throughout the episode are brief but he does make a lasting impression. Alex has the almost thankless task of being locked in a box for almost the entire episode. She’s far from a helpless damsel but the episode ends up being about her without featuring her too heavily. The focus is on what she represents to Kara and Maggie mainly with some input from J’Onn. Her attempts at escape are pretty inventive and definitely in keeping with Alex’s skills. There is some time devoted to Alex and Maggie’s relationship. Maggie allows herself to be really vulnerable when talking about all of the experiences that she wants to have with Alex and bares her soul in terms of how emotionally invested she is. This relationship has been developed so well that the moment feels sincere and genuine while showing that their relationship is at the point it has become serious. It feels organic as far as development goes and the actors are great to watch together as always. It appears that we are starting to inch towards some sort of endgame for the season with Rhea and Lena’s potential partnership. Rhea approaches Lena about building some kind of gateway allowing for instant travel across long distances. 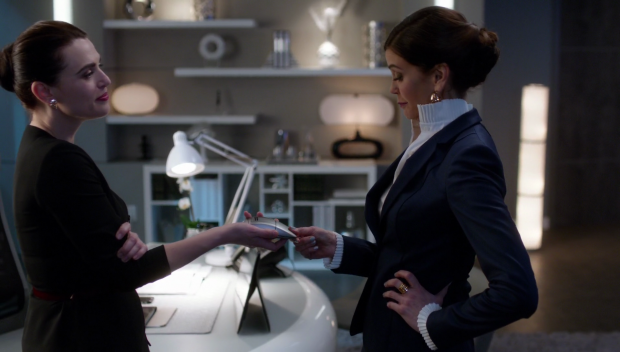 Lena seems receptive at first but isn’t without her suspicions which she confirms in a clever misdirect bringing back her alien detector from “Welcome to Earth“. This gives us further evidence of how clever Lena is as her suspicions appear from one small phrase where she refers to “Gods”. It risks derailing the partnership and with it, Rhea’s plans but the episode does a good job developing their interactions as warm and respectful. Rhea isn’t being honest with her but tells a version of the truth that is enough to convince Lena that moving ahead with the plan is something worth doing. Rather than continuing to hint that Lena might be up to no good this changes it up a little by having her be an innocent victim in Rhea’s scheme. She is able to retain her intelligence and agency but Rhea shows how manipulative she can be and keeps this dynamic going. Of course with the way previous potential season arc stories have gone it’s entirely possible that this could be completely wrapped up by the end of the next episode but I hope not as it might be interesting to see Rhea continue to manipulate the situation as well as tease what her overall plan is in the short time the season has left. I’m guessing she will use the gate to bring Daxamites to Earth and begin an invasion but there are plenty of ways this can go. A well constructed character driven episode that focuses on how Kara and Maggie relate to Alex. They are both close to Alex in different ways and adding some tension in their interactions is a really nice touch. The way the episode builds the reason for them not seeing eye to eye and resolving it by each of them seeing the point of view of the other is really well done. Alex is far from a captured damsel but she represents how the people in her life regard her rather than being involved in the plot. She does get some nifty escape attempts and uses her wits but for the most part she is locked in a box. There’s a really good scene where Maggie talk about everything she wants from their relationship indicating just how serious it is. The villain is a mixed bag. Revealing him to be someone from Alex and Kara’s childhood complete with reused flashbacks is a nice touch but it’s hard to believe that he’s such a genius especially when we see just how intricate his plan is. He is one of the better villains the show has had and his father makes for a memorable presence as well. The subplot involving Rhea and Lena works really well and establishes what could be the endgame for the season. Rhea is shown to be manipulative in a really subtle way and Lena is able to remain intelligent in the way she figures out that Rhea is an alien. This story has potential and Rhea’s objective is still unclear.